This large green nephrite plaque represents a dragon with its head turned. The plaque exhibits a few traces of burial deposit and is slightly calcified in places. The large U-shaped curving silhouette of the dragons sinuous body fills the center of the motif. The forceful design with its curves and counter curves displays a skillfully orchestrated symmetry. A simple carved line picks out the contours of the dragons body, while the lines are more numerous on the highly stylized tail and legs where they give added flourish to the design, in stark contrast to the regular pattern of “sprouting-grain” dots decorating the body. A hole for hanging is provided at the tip of the U-shaped curve. 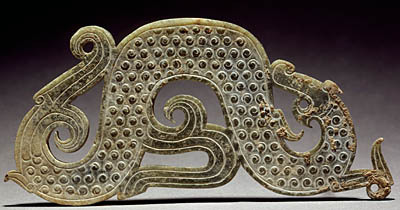 This type of piece appeared during the Warring States period, as a result of the flourishing production of jade ornaments. This production was spurred by increasingly frequent contacts with the peoples of Chinas northeastern frontiers who exported the precious material quarried at Khotan in Central Asia. Under the Western Zhou, indigenous jade sources had been depleted and production of jade objects for ritual purposes declined, replaced by the production of ornamental finery. This trend, enforced by circumstances, remained unaltered by the introduction of imported jade. The ancient functions associated with the material were supplemented by new uses as a talisman of immortality and symbol of human virtue. The motif of the dragon, the animal that symbolized the East, the rebirth of nature and of human virtue, became omnipresent.The curling decoration (known as a “silk worm”, then, later, “sprouting grain” pattern) was an invention of the Chu, as was, apparently, this particular dragon motif, several specimens of which come from tombs in Anhui and Hubei.